The aircrew of 617 Squadron Commander (later Wing Commander) Guy Penrose Gibson (August 12, 1918 - September 19, 1944) are debriefed after Operation Chastise, which destroyed the Mohne and Oder Dams in the Ruhr on May 16/17 1943 to disrupt electricity generation for munitions factories. 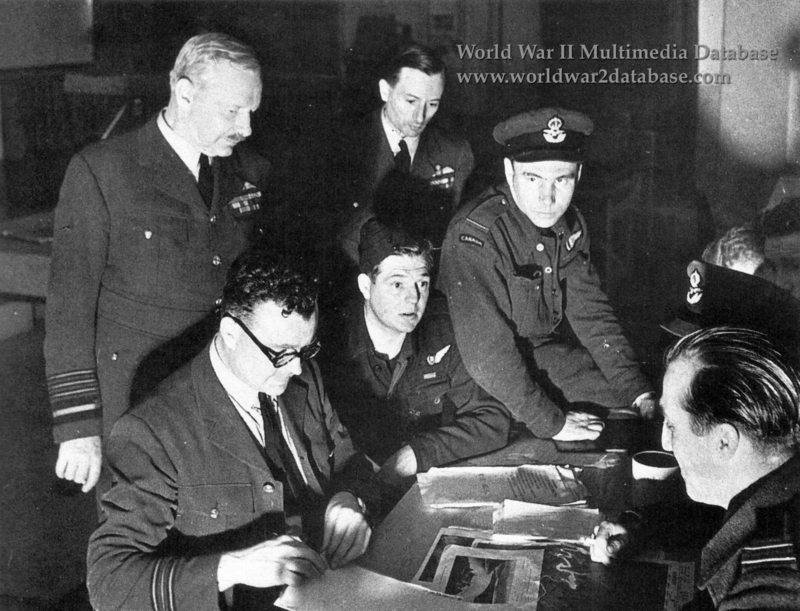 From left to right: Standing are Head of Bomber Command Air Chief Marshal Sir Arthur Travers Harris (April 13, 1892 - April 5, 1984) and 5 Group Commander Air Vice Marshal Sir Ralph Alexander Cochrane (February 24, 1895 - December 17, 1977) as they observe the debriefing. Seated facing the camera are Intelligence Officer Squadron Leader Townson; Bombardier Pilot Officer Frederick Michael "Spam" Spafford (June 16, 1918 - September 16, 1943) of Wayville, Adelaide, Australia; and Navigator Pilot Officer Torger Harlo "Terry" Taerum (May 22, 1920 - September 16, 1943) Seated with their backs to the camera are, in the foreground, Rear Turret Gunner Flight Lieutenant Richard Algernon Dacre Trevor-Roper (May 19, 1915 - March 31, 1944) of Isle of Wight, England; obscured are Flight Engineer Sergeant John Pulford (???? - February 13, 1944) of Hull, England; Front Turret Gunner Flight Sergeant George Andrew "Tony" Deering (???? - September 16, 1943) of Ireland and Canada; and Wireless Operator Flight Lieutenant Robert Edward Hutchinson (1918 - September 16, 1943) of Liverpool, England. This crew flew an Avro Lancaster B Mark III Special, serial #ED932, marked AJ-G, modified to carry the 9,250-pound (4196-kilogram) Vickers Type 464 spinning bomb codenamed "Upkeep" designed by Sir Barnes Neville Wallis (September 26, 1887 - October 30, 1979). This bomb was rotated as it hung exposed in the bomb bay of the Lancaster, and then dropped from 60 feet (18.2 meters), which was maintained by visually observing two spotlights mounted fore and aft and angled to intersect at that altitude. A simple bombsight of a stick with two nails aligned with the towers of the Mohne Dam for optimal release distance at 400 yards (365 meters). Nineteen of twenty-one Lancasters of 617 Squadron attacked the dams; Gibson's crew took off at 2139 Hours. Gibson later said, "We were flying so low that more than once 'Spam' yelled at me to pull up quickly to avoid high-tension wires and tall trees." Gibson's bomb exploded short of the dam itself at 0028 Hours, but two other Lancasters successfully breeched the Mohne Dam minutes later. Gibson then led the remaining Landcasters against the Eder between 0130 and 0200 Hours, again successfully breeching the dam. However, eight of the nineteen bombers were shot down or caught in the explosions of their own bombs. Due to the low altitude, only three of the downed airmen survived to be taken prisoner. Gibson and 76 other aircrew of 617 Squadron returned to base; 53 were killed. On the ground, 1,650 people were killed in the resultant flooding of the Ruhr Valley; 1,026 were prisoners of war, including 526 Soviet women in the town of Neheim. Unknown numbers of livestock perished, and much viable farmland flooded, which impeded food production the following season. Power generation was restored within a week due to an emergency pumping station, and the war production plants were largely unaffected. For Allied morale, the raid was a great success, and Gibson toured the United States and Canada selling war bonds and making appearances before returning to combat. Gibson won the Victoria Cross, and the crew all received the Distinguished Flying Cross, except for Pulford, who as an enlisted man received the Distinguished Flying Medal. Gibson and his entire crew died during the war, in various combat actions and accidents. He was killed flying a Mosquito over Germany. Four of them died in the same Lancaster when it was lost in action exactly four months later.